Obi-Wan Kenobi called Mos Eisley a wretched hive of scum and villainy, but I’ll bet that’s just because they hadn’t discovered any sodium bicarbonate on Tatooine. We are SO lucky to have plenty of baking soda on Planet Earth. According to Planetgreen, there are 17,000 petrochemicals available for home use – many of them for cleaning. But all you really need to start the new year with that sparkling fresh feeling is a couple of common materials. At the top of that short list is Baking Soda – make a paste and scrub just about anything. A baking soda paste allowed to sit overnight can replace those toxic oven cleaners. And baking soda followed by boiling water can unplug many drains. If you polish silver (which around my house would be a whopping big IF) silver polish is toxic too. Is this what we want to leave a film of on our eating implements? Again with the baking soda. How about your carpet? When did you last put your nose down there and have a good sniff? Don’t tell me. Instead sprinkle it with baking soda and then vacuum up grunge and odors together. So, stock up on that wonderful, white stuff. These are four of my favorite green cleaning websites. If you have another or a great green cleaning discovery, PLEASE SHARE!!! The Daily Green has a nice photo essay with good, specific details on how to clean up a lot of kitchen grime. U.S. Department of Health & Human Services has a website where you browse for the hazard quotient of just about any household product. It’s a regular chamber of horrors. Young House Love is a great blog by a young couple who began a few years ago documenting their work on the house they just bought. Their narrative has gained a following. Their tips and hints are very useable. They’ve built a well-earned following with their substantial posts on many aspect of homemaking, and their green cleaning post is really comprehensive. Yes, Seventh Generation is a commercial concern, and as always, Buyer Beware, but they have a lot of useful material in there, and I think this is the kind of commercial enterprise that should be supported. ....This doesn't have anything to do with cleaning. 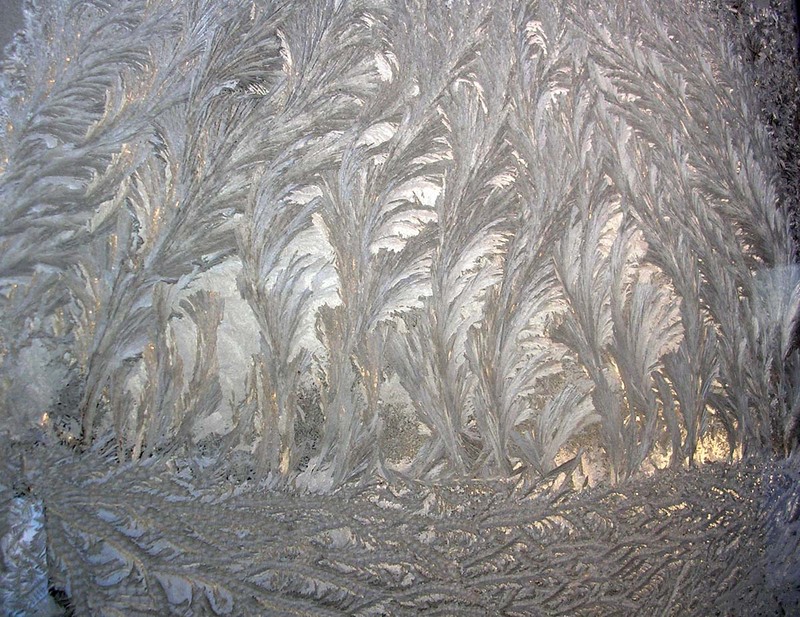 Just what Jack Frost did on our barn window New Year's Day. Thanks so much for the shout out! We’re blushing over here. And we’re so glad you sent us the link to your blog- it’s full of great info! And I thank you. Since my daughter called you to my attention, your blog has been one that I really admire. Not to mention that you can use baking soda and water to brush your teeth. It’s a bit salty, but you get used to it! Yes, I haven’t brushed with baking soda except when the toothpaste had run out and not been replaced yet, but I get very worried about WHAT is in that stuff in the tube. Especially now when you can hardly find a brand that does not include “whiteners.” And then there are the actual tubes — destined for landfill. I’m going to give baking soda a try.